It was a busy day at Orphans of the Storm®, with some happy doggy adoptions! There are still plenty of pooches waiting for the right person to find them. 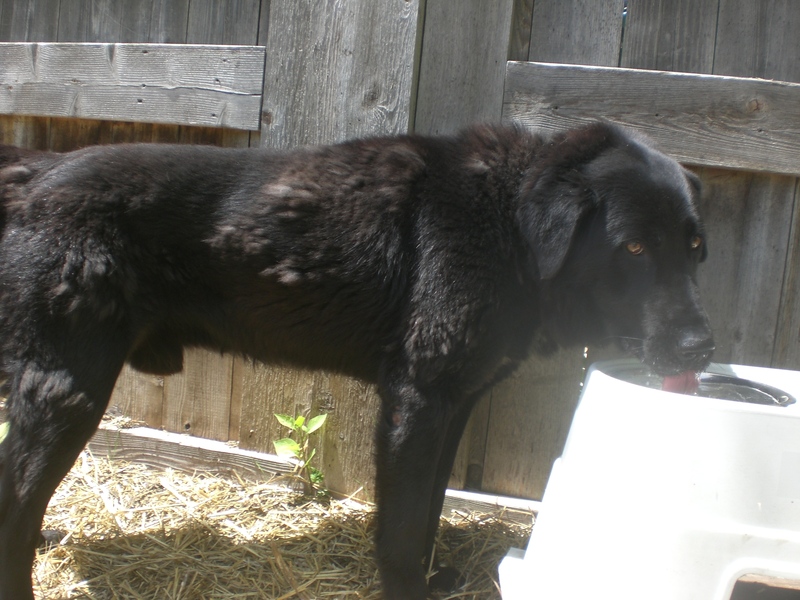 Coffey the seven-year-old black Labrador Retriever mix is a big, fluffy, affectionate boy looking for a nice family to join. Those of you who have been reading for a while now know that I love all of the older black Labs I meet at the shelter, and Coffey is no exception (though Coffey really isn’t even that old!). Coffey’s whole body was wiggling with excitement when he saw that he was going for a walk. He is a strong boy who can pull a bit on the leash at first, but after he gets a chance to stretch his legs he settles down and walks nicely. Coffey is a fan of both giving and receiving affection. You won’t want to stop petting him because he’s just so fluffy, and he will happily give you lots of doggy kisses in return. Coffey was friendly with everybody we came across and that tail was wagging pretty much the entire time. As I always say, a Lab is a Lab is a Lab–don’t let Black Dog Syndrome stop you from getting to know a wonderful dog! Come in soon to see if Coffey is the pooch for you. 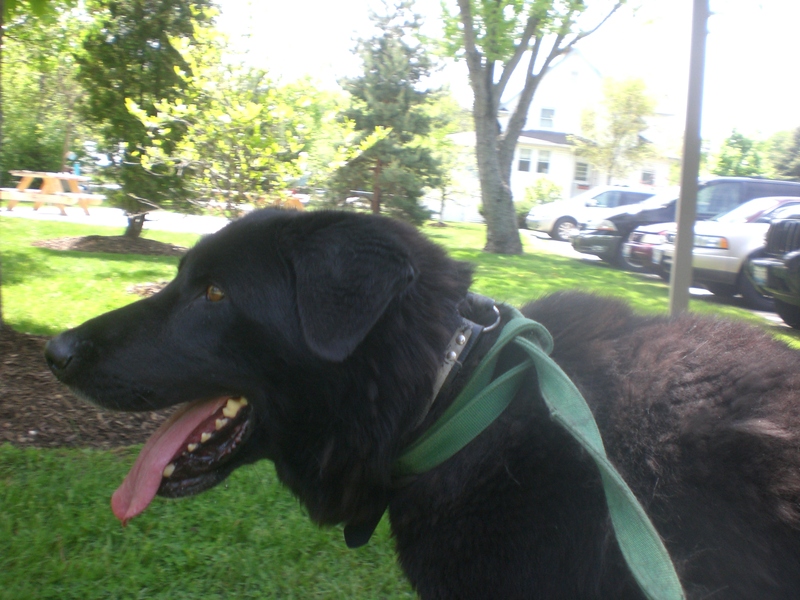 James the six-year-old Rottweiler/Shepherd mix was a little shy and unsure when he first came out to walk with me, but who can blame him? James came from an owner who lost their job and could no longer care for him, but James doesn’t understand that. He’s used to being in a home and has many years of experience as a loyal companion, so he’s more than ready to leave the shelter and settle into a new home with a new family. James warmed up to me after just a few short minutes, though. He enjoyed exploring the off-leash run and walked pretty nicely on the leash when we took a stroll around the shelter grounds. Once he realized that I was just there to give him some attention, he gave me a few sweet doggy kisses and stayed by me while I scratched his neck and hips. James knows what it means to be a pet, so let him show you what a good boy he can be! 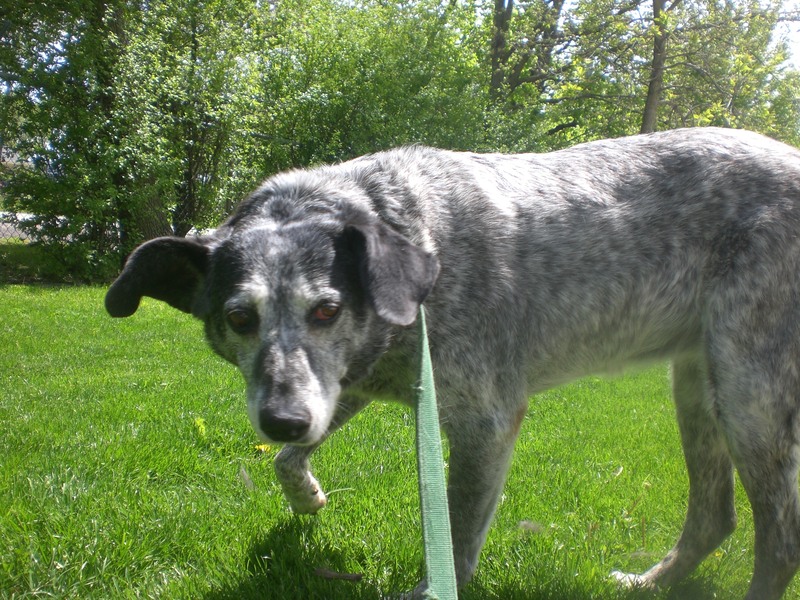 Jenny the seven-year-old Australian Shepherd/Blue Heeler mix is pretty much everybody’s favorite dog at the shelter right now because she is so sweet, gentle, and easy-going. She is an absolute breeze to walk on a leash: when I stopped moving, she stopped right next to me; when I started walking again, she was right there by my side, step for step. I’ve met some good leash-walkers before, but Jenny just might take the crown. Jenny seems like she would enjoy the simple things in life. We found a shady spot in the grass where I sat down and she laid down next to me, resting her head against my leg and rolling onto her side so I could give her a belly rub. We probably could have stayed like that for the entire afternoon and both of us would have been happy. 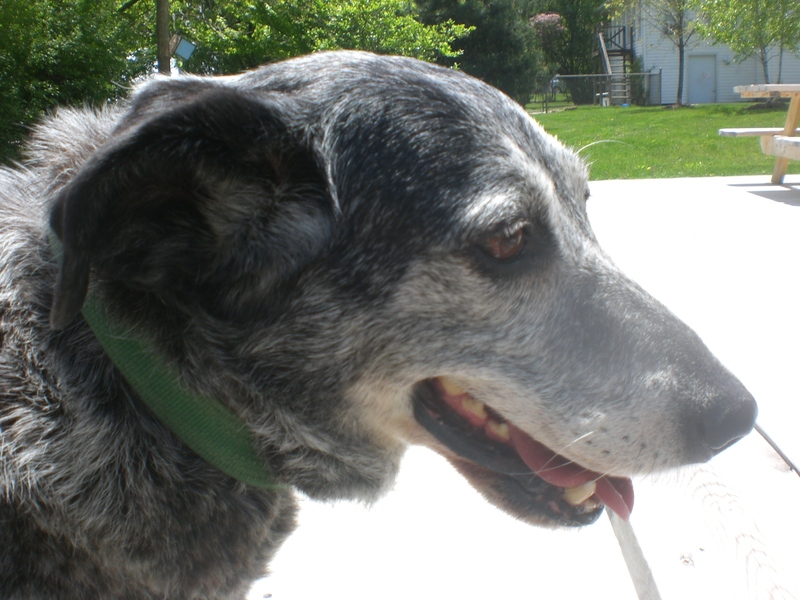 If you’re looking for a calm, sweet, laidback dog, look no further than Jenny! Frisco the two-year-old Mountain Cur mix is the perfect combination of cute and fun. Frisco is the type of dog who almost always has a doggy grin on his face, because he’s just so happy all the time! 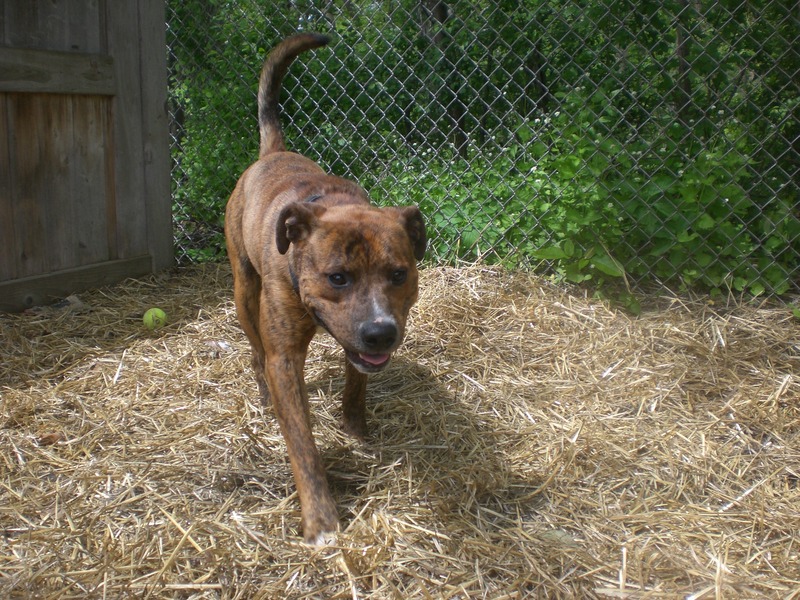 He also has a beautiful brindle coat and an adorable face and ears. Frisco walks pretty well on the leash but was happy to explore the off-leash run. Frisco is a cuddly sort of guy. While we were in the off-leash run, he joined me on the bench, put his front paws in my lap, and proceeded to cover my face with doggy kisses. Frisco is also pretty friendly with other dogs. He met an older dog and a much smaller dog, and he was polite and gentle with both of them. Frisco is ready for a family to call his own–maybe that family is yours! I was also first greeted at the shelter by Molly, who gave me a big doggy hug when she saw me. I tell you, if you’re looking for a dog who will be an excellent running buddy and the best fetcher you’ve ever seen, Molly is your girl. On the other end of the activity spectrum is Archie, who is just the sweetest and gentlest and bestest and I would have taken him home with me weeks ago if I could! He’s a little on the skittish side (he was found as a stray, after all, so it’s hard to know how much human interaction he’s had), but once he knows you’re a good guy he will stay right by you and just enjoy getting the love and attention he deserves. I also saw my buddy Javan, who is another great giver of doggy hugs and loves getting his neck and ears scratched while he does so. This is one snuggly pooch! Brothers Wilbur and Rosco are also still looking for their furever home. 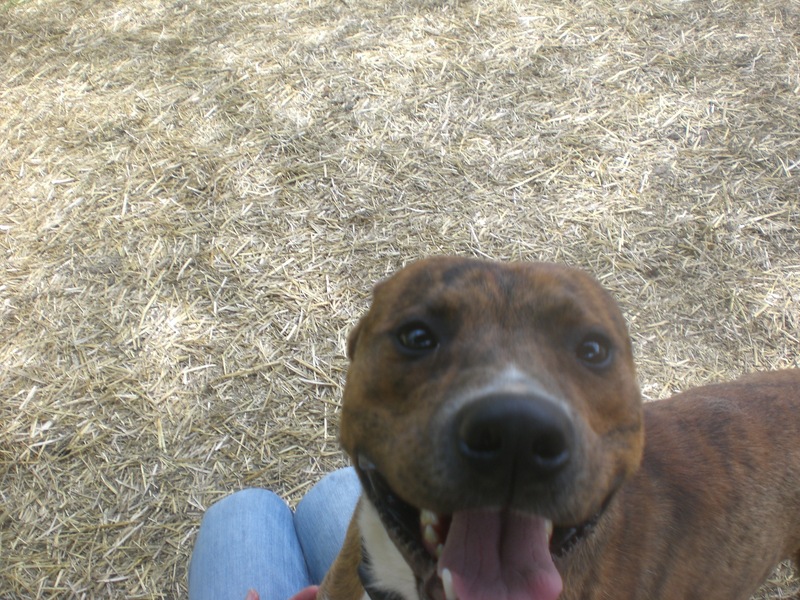 Wilbur is my favorite dog at the shelter, and he knows it. He knows it so well, in fact, that he now refuses to go back to his kennel if I’m the one walking him because he knows I’m a softy and I’ll just keep him out longer. So sneaky! 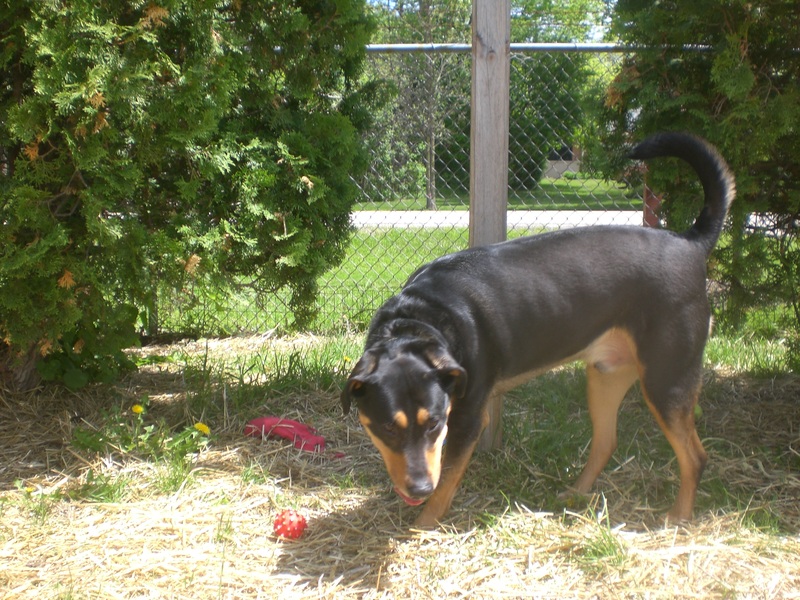 Rosco is great too–I just personally prefer couch potatoes, and Rosco loves to run! If you want to see what happiness looks like, take Rosco to the off-leash run and let him loose–the pure joy on his face while he runs some laps is the best. You could see that joy every day if you adopted him! I also need to take a moment to talk about Gizmo. People see Gizmo jumping up and down in his kennel and hurry right past because they think he will be too much to handle. Au contraire! I walked Gizmo this week and he did such a good job walking on the leash. He’s all pent up in his kennel, but once he’s out and about he calms down in just a few short minutes and becomes a great walking buddy. Gizmo is also super affectionate. I knelt down next to him and he immediately started giving me doggy kisses. Gizmo is a perfect example of why it is so important to give the dogs a chance outside of their kennels. You may be pleasantly surprised! 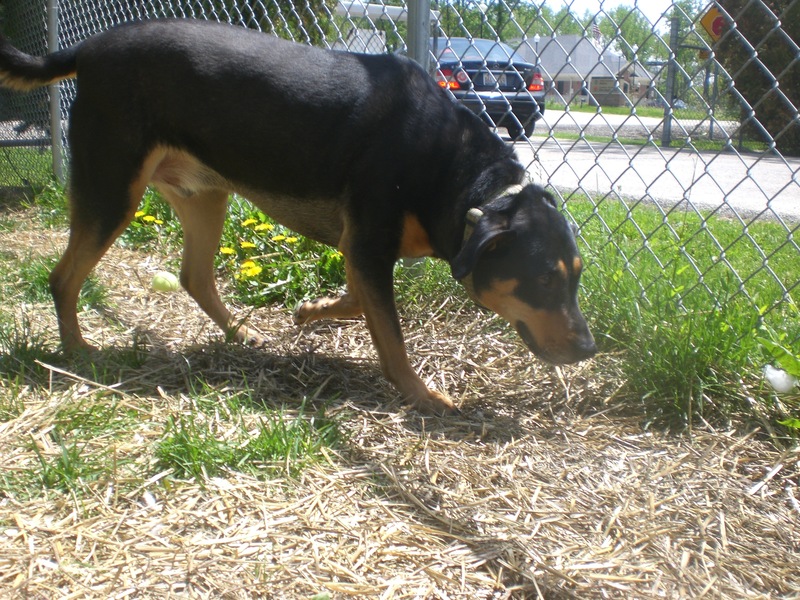 Posted by Meet the Pooches on May 29, 2014 in Dog Profiles and tagged adoption, animal shelter, animals, Australian Shepherd, Blue Heeler, Chicago, dogs, Labrador Retriever, Mountain Cur, Orphans of the Storm, pets, Rottweiler, Shepherd.